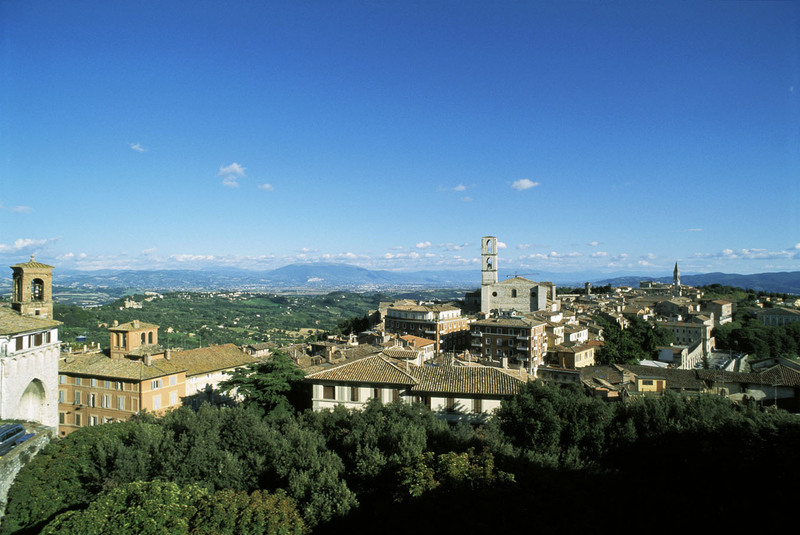 Perugia is a beautiful hill town in Umbria. I find the skyline, with distant mountains punctuated by church towers, one of the most beautiful I have ever seen. The trees are a bonus. 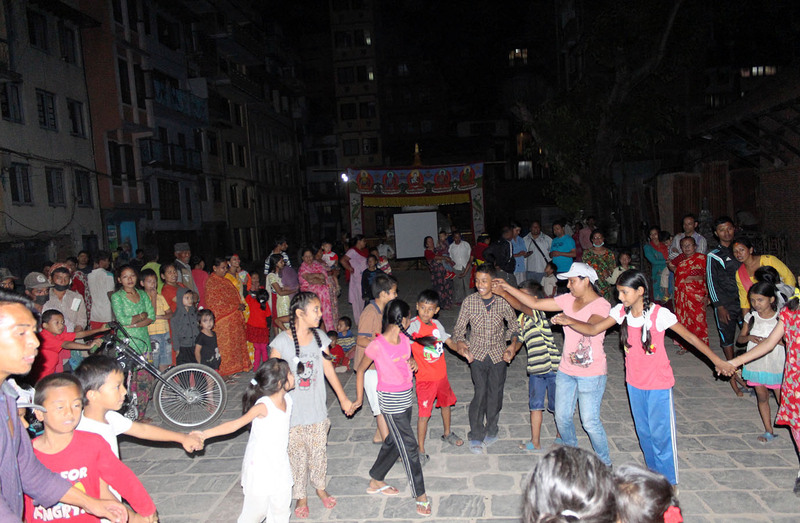 The photographs below are a selection from the Carfree Day events in the Kilagal neighborhood of central Kathmandu. See the Feature Article, below right, for a description of the event and its preparations. Bhaktapur was quite hard hit by the recent twin earthquakes. 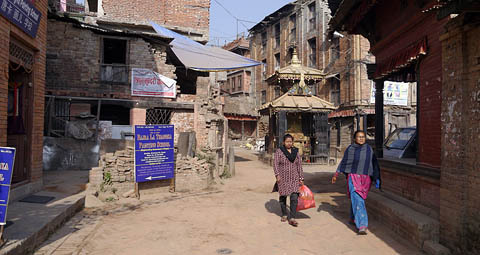 Some other cities in the Kathmandu Valley were even worse hit, but historic Bhaktapur had significant damage. 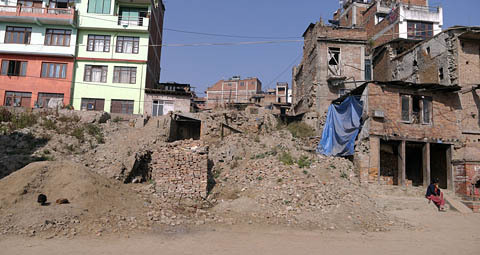 Some parts of the city were hit even harder than what is shown below. Demolition and debris removal are essentially complete, but only temporary buildings have so far been erected. Carfree.com, HealthBridge Canada, and Work for a Better Bangladesh released this 53-minute film in August. The film proposes solutions to the challenges on the way to a sustainable society. The film proceeds from the carfree city as a point of reference and essential step in solving many of the problems we face. A slightly recut version, with a few more pauses for air, has just been posted at the Vimeo link above. Some other minor improvements were also made. I am sad to say that, although the film was enthusiastically received by live audiences, online viewership of the film has been modest. I urge supporters of the carfree agenda to view the film and, assuming you like it, to arrange a local showing followed by a discussion program. Long films rarely get large followings online - people click away after a minute if there have been no cute cats or live murders. The film has been subject to somewhat contradictory criticisms. It's too long, but there's too much material presented. I don't know how to respond to this. There is an immense amount of material in a relatively short film. We were convinced of the need for a wide-ranging look at responses to climate change. At the same time, we are certain that current approaches simply do not go far enough. The film was released under a Creative Commons non-commercial, attribution-only license, and anyone can make a localized version. We can furnish all the materials that went into making the initial version. You can also use the Carfree channel at Vimeo, which gives access to another 30 videos on carfree cities and related issues. If you watch a video, please Like it by clicking the Heart icon in the top-right of the video frame (Vimeo) or clicking the Thumbs Up icon below the video (YouTube). Posting to Twitter and Facebook will also help get the message out to a broader audience. Carfree.com tries to maintain a long list of links, and our Ram Kumar has just gone through them and eliminated the dead ones. The links pages are organized by category, with each site appearing in all relevant categories. The order of the links is an indication of our assessment of their importance and usefulness. Feel free to suggest new links by sending mail. Ten years ago this month, I published "A Brief History of Urban Form: Street Layout Through the Ages" in the Papers section of Carfree.com. This was the result of a year's intensive study of the history of urban form. This paper became part of the foundation of Carfree Design Manual, and a shortened version is included in the book. I recently read it again after a long lapse and would like to recommend it to readers of Carfree Times. It's a fairly long read and will not yield much from a quick browse. This is also a good time to recall a brilliant thesis by Robert S. Matthews, MUP, that was also written ten years ago. Rob had done an internship at Carfree.com and did much of the work on his thesis during that period. It is a fascinating comparison of the carfree Reference Design with the Wallingford neighborhood, a highly-prized, near-in suburb of Seattle. Rob compared the two districts on many different measures. Even I was surprised by how favorably the Reference Design compares to what can be regarded as best practice in suburban design. This paper is over 100 pages long, but a lot can be gleaned in 15 minutes. It, too, is available on our web site: "The Production of Sustainable Urban Space: A Comparative Analysis of Wallingford and the Carfree Reference District." 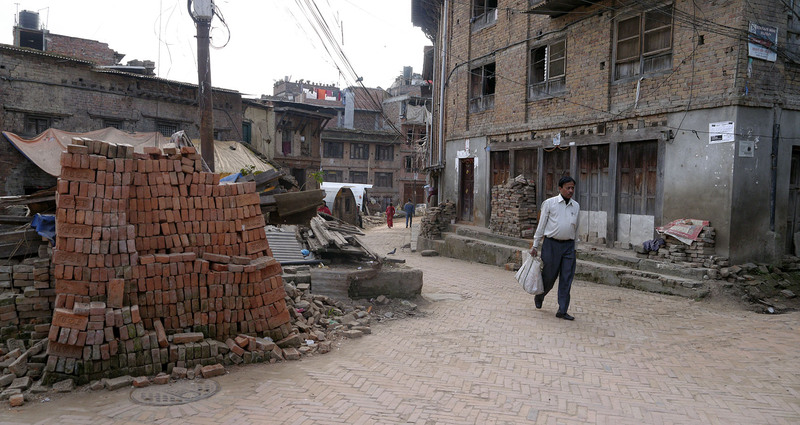 2015 has been a very difficult year for Nepal. 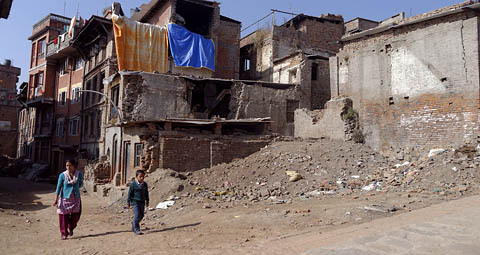 As if the damage from the two major earthquakes this spring were not enough, Nepal has now been subject to a blockade on its Indian border for more than two months. 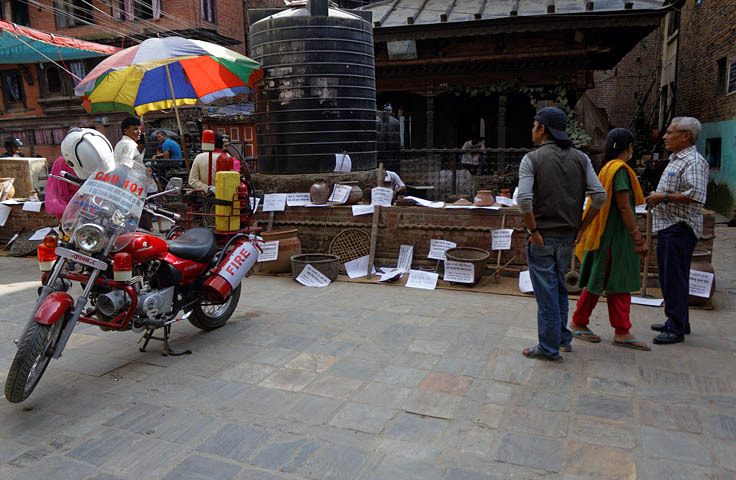 Very little fuel, medicine, or other supplies are reaching the Kathmandu Valley. There is a thriving black market in motor fuels at exorbitant prices. 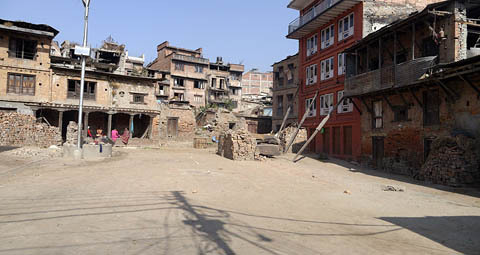 Despite this, there are still traffic jams in Kathmandu. 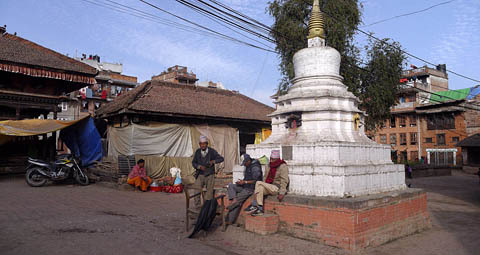 The blockade arose when Nepal adopted a new constitution that is not to the liking of some groups in the Terai region (a lowland area along the border with India). India has tacitly supported the Nepali protesters. Progress towards resolving this dispute has so far been very slow, and it may continue through the winter, which will bring hardship to most people, as cooking gas is all but unavailable. The demolition phase of disaster recovery is essentially over, but very little reconstruction has begun. 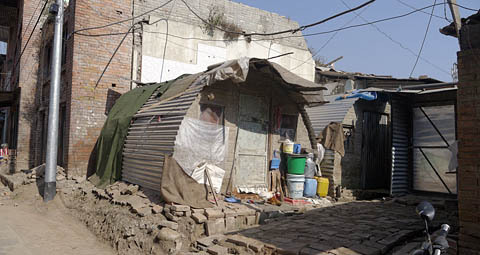 Many families are facing a winter in tents and temporary shelters. 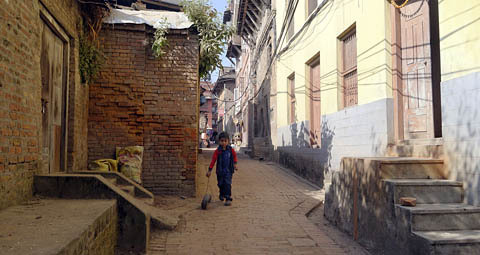 The schools have been closed for a lot of the school year due to both the earthquake and the blockade. Carfree.com supports World Carfree Network (WCN). Anyone who could provide significant seed money for the Network to resume operations would attain instant Guardian Angel status. 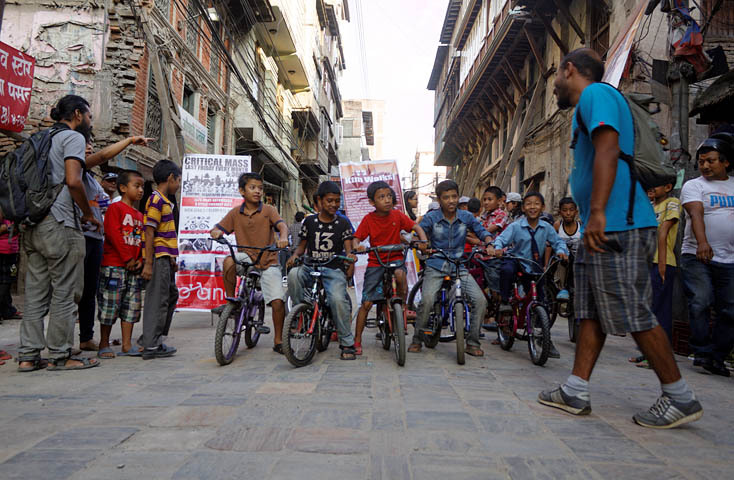 Carfree Times #75 reported on the celebration of World Carfree Day 2014 in Kathmandu, Nepal. Last year, KtmWalks celebrated a week-long carfree event in several parts of the city on different days. Bhaktapur also celebrated Carfree Day for a few hours in Taumadhi Square, a first for Bhaktapur. 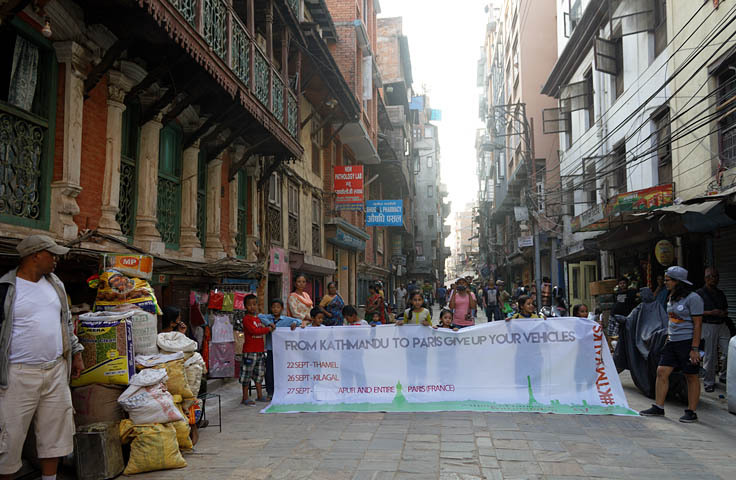 On October 2nd and 5th of this year, Kathmandu again celebrated World Carfree Day with events that were scaled down from last year. 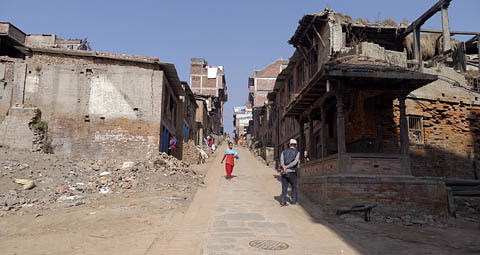 Bhaktapur was unable to celebrate Carfree Day at all. 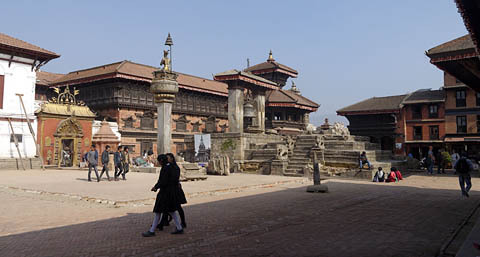 These scaled-backs events were a consequence of crisis caused by the ongoing Indian blockade of Nepal as well as the earthquake, which was especially severe in Bhaktapur. Every year on or about 22 September, people all around the world get together to reclaim their streets and neighborhoods as a way to remind us that the world does not have to accept a car-dominated society. This event promotes priority for walking, cycling, public transit, and public spaces. 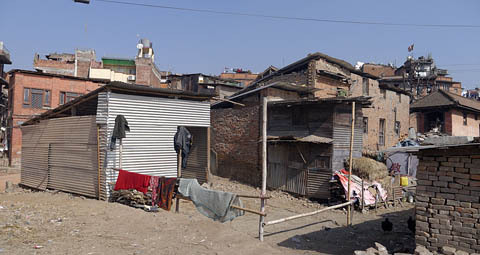 The development of communities with local job opportunities and shopping within walking distance are stressed. Reducing the adverse effects of car culture in our society is also a central theme. Carfree Day also illustrates the advantages of reduced pollution, more sustainable living, greater community engagement, and enjoyment of a healthier way of life. This year, 330 cities and towns around the world celebrated World Carfree Day. Paris celebrated World Carfree Day on 27 September 2015 by banning motor vehicles in the center city and reducing the speed limit in other districts. Dhaka, Bangladesh, celebrated its first-ever Carfree Day on 21 September. Guragaon, India, rather than simply observing a carfree day once a year, is holding a carfree day every Tuesday. The date originally proposed for the carfree celebration was 22 September, the official day for observing World Carfree Day. 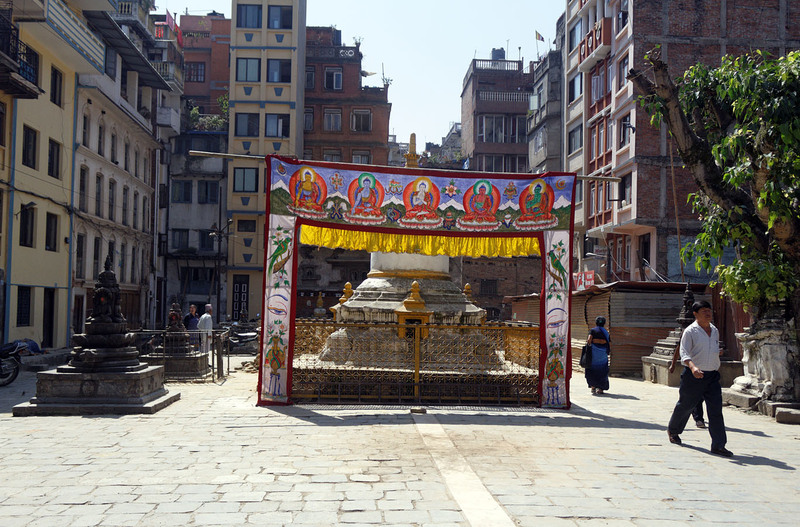 However, it was actually observed two weeks later here because Nepal had just adopted a new constitution and because that date conflicted with the observance of Indrajatra, a major local festival. On 23 September, India imposed an unofficial blockade on all supplies to Nepal including fuel, virtually all of which comes through India. This presented both obstacles and opportunities for the Carfree Day events. 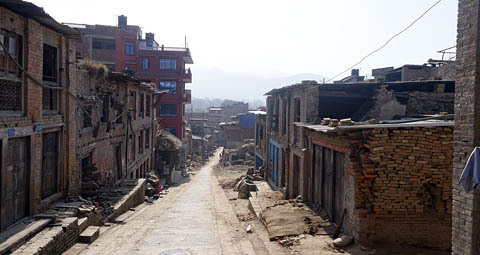 On the one hand, community members were reluctant to organize an event during the crisis. There were doubts about how local residents and the business community would respond to the event, and questions about media coverage at a time when political matters were the top priority. The number of participants at the event would also be affected because transport to the event would be difficult even if advance promotion of the event succeeded. On the other hand, the reduced vehicular traffic would simplify traffic control in the temporarily carfree areas. The fuel crisis also raised the issue of a way of life so dependent on supplies of fossil fuel and made Carfree Day events more relevant and immediate. 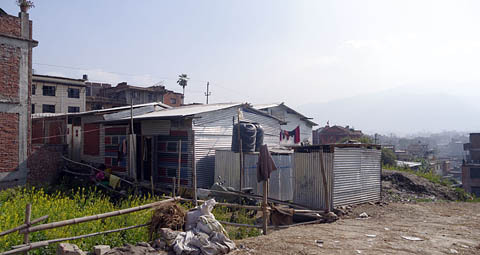 The issue of city planning would also be brought into sharp focus. As a result of the earthquakes, the planning for Carfree Day celebrations only began in early September. 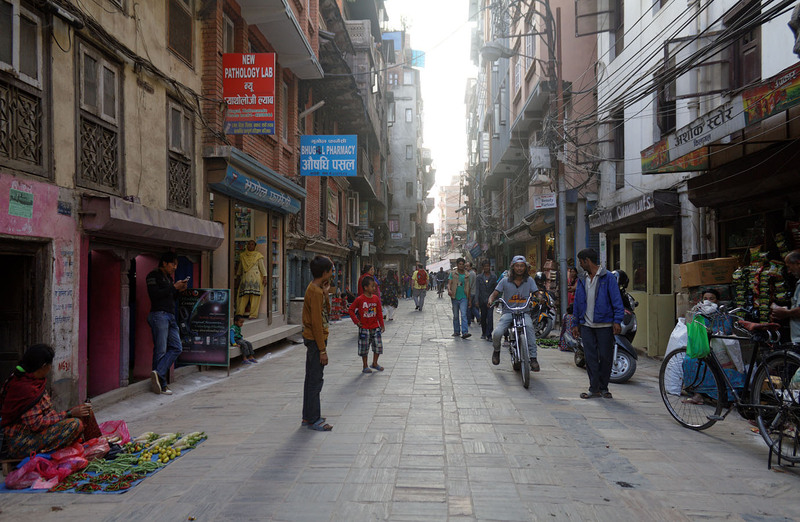 On 30 September, we held a press conference at Mandala Street, the first street in Kathmandu free of private vehicles. 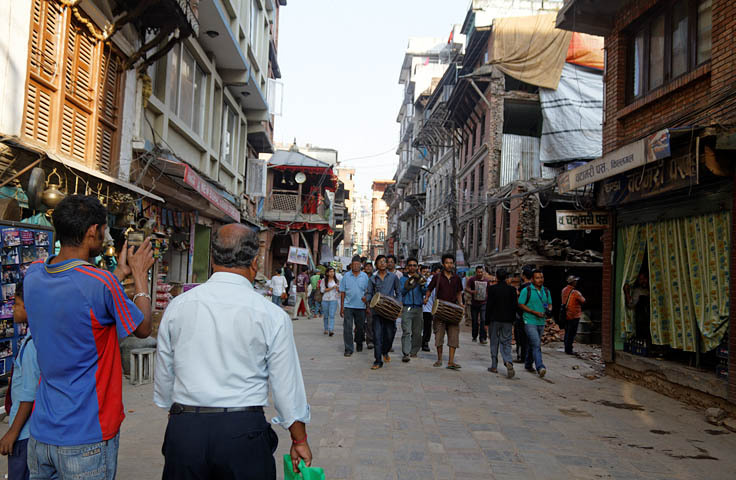 Following the earthquakes, local businesses in Thamel (the center of tourism in Kathmandu) wanted to promote Thamel as a safe place for foreigners. 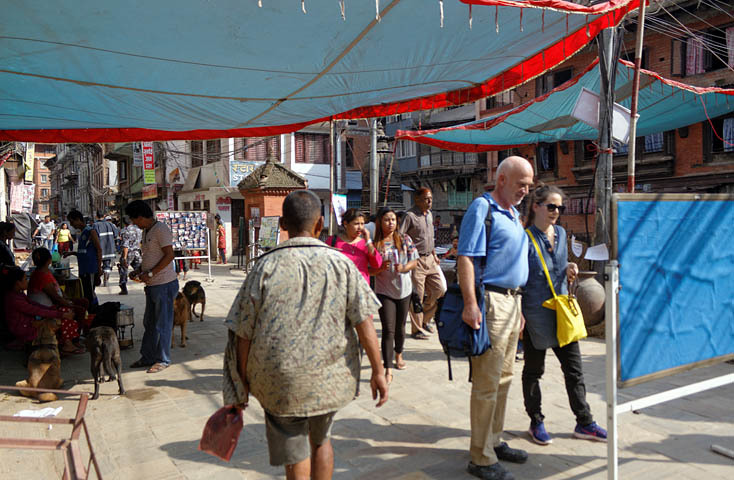 Thamel Tourism Development Council (TTDC) is a group of tourism-related businessmen and local householders devoted to development of tourism in Thamel. The event started with the traditional Dhime Baja (traditional band), peacock dance, and ribbon cutting ceremony by the chief guest. There were street activities on each stretch of the road. 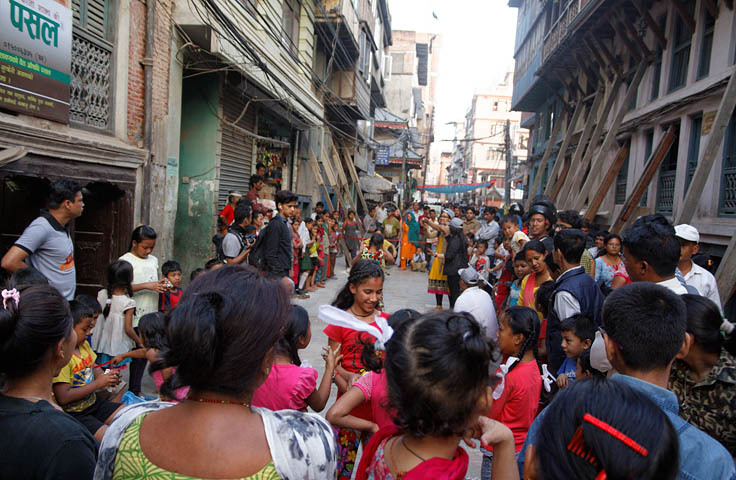 There was street dancing, a street concert, street art, an ethnic ramp walk, a slow-cycle race, various games, and a showing of a new, short documentary on Mandala Street, the first carfree street in Thamel. 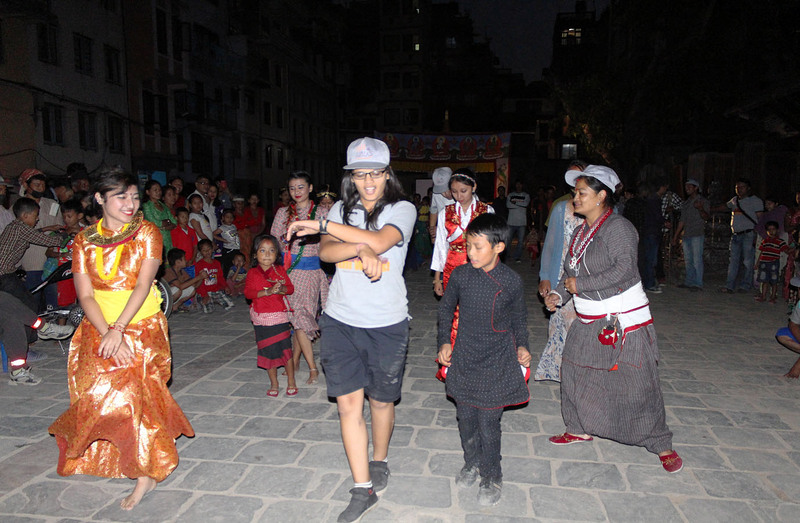 Many people from local businesses in the Satghumti area joined in the street dancing. 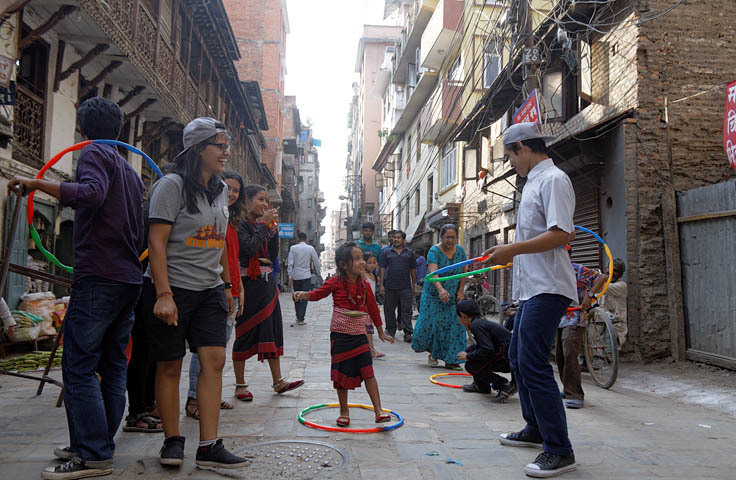 Last year, we did not see many kids enjoying life on the carfree street, but this year the street was filled with children and young people enjoying the games. Unlike last year, we did not have to explain to people what the event was about, as they were already familiar with it from last year. As a consequence of the blockade, people also began to realize the importance of local urban conditions and the consequences of depending on foreign supplies of fuel. There was also increased awareness of the importance of public transport and improved walking and cycling conditions. Despite the struggle to find bottled gas to run the stoves in their homes and hotels, people were positive about the coming changes in the political situation as a result of adopting a constitution. The event was considerably more effective than the KtmWalks team had anticipated. TTDC also proposed to plan Carfree Day as a quarterly event and indicated a willingness to include it on their yearly calendar. During the earthquakes, the core of Kathmandu was more heavily damaged than the newer concrete buildings in the city expansion districts. 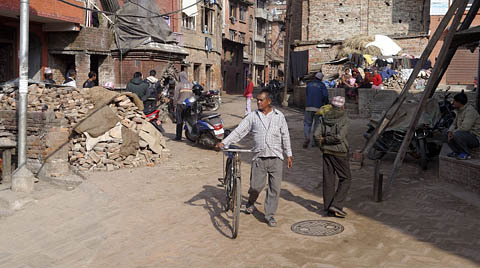 Kilagal, being one of the oldest parts of the city, suffered considerable damage, and the community was in no mood to celebrate Carfree Day or restrict vehicle movement. 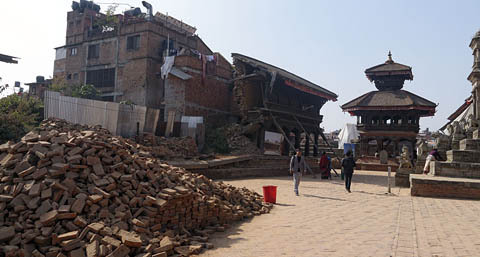 Even now, demolition of damaged buildings in the area is ongoing. 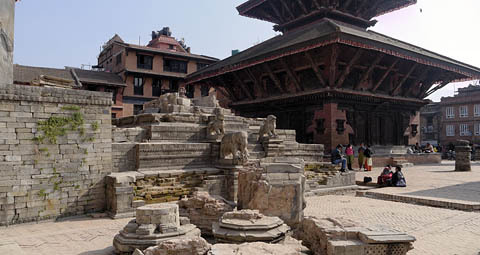 Recovery of artefacts from damaged monuments was continuing. Almost no reconstruction has begun. After a few meetings and discussions with the community people, it was nonetheless concluded that Kilagal should not miss celebrating Carfree Day. The proposed date for the event was 26 September, but it was postponed to 5 October, as already noted. 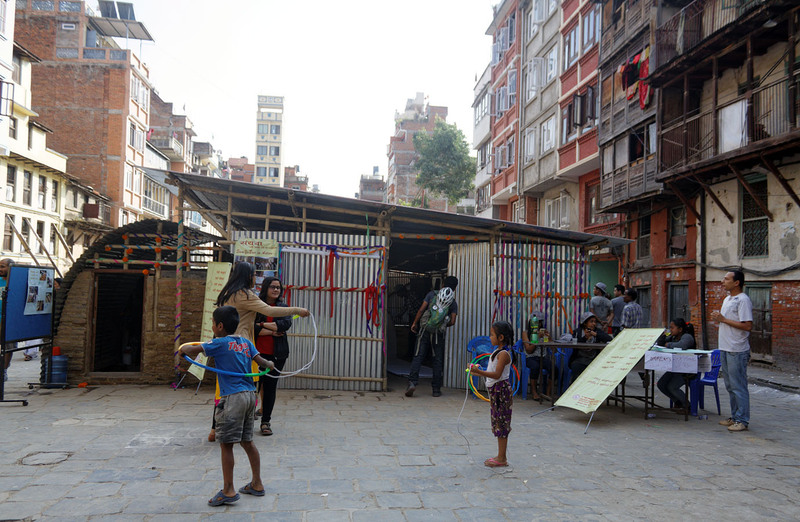 This year the theme for UN-Habitat on World Habitat Day was Public Spaces for All. The date of World Habitat Day coincided with that of World Carfree Day, so the local UN-Habitat office also took part in the carfree event. 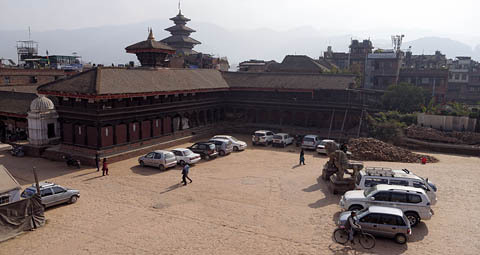 Heritage conservation work began soon after the earthquake. 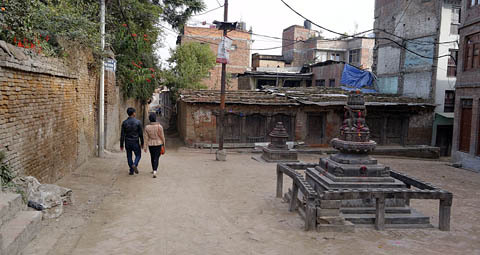 Among other activities, a heritage conservation shelter was built in Kilagal's Itumbahal Square, where ancient artifacts such as carved wooden windows were being collected for restoration. This event also increased awareness about conservation of open space and streets with cultural significance that are now threatened by traffic. Local community groups and business stakeholders seemed to be familiar with the concept of the carfree day and accepted the idea more readily this year than last. In previous events, the community had not been clearly introduced to the concept and purpose of the event, and so they took the role of observer, not participant, and had more critical views regarding the event. This time the community participated in managing the event. There were fewer street activities this year due to the short time available to prepare for the event, but local business people took advantage of the event by extending their shops into the street, which improved the festive atmosphere of the event. Some representatives from the community expressed interest in holding a regular carfree day, probably on a Saturday. This also indicates that the community is beginning to take ownership of the event. The event was largely self-organizing. The day was distinctly cleaner, more peaceful, and more pleasant in the area of the event. The concept and relevance of a carfree street has been well observed among the communities where the event had been conducted previously, thus indicating the success of last year's Carfree Day. This year there was self-ownership within the community groups, so they took a lead in arranging the event to make it successful. 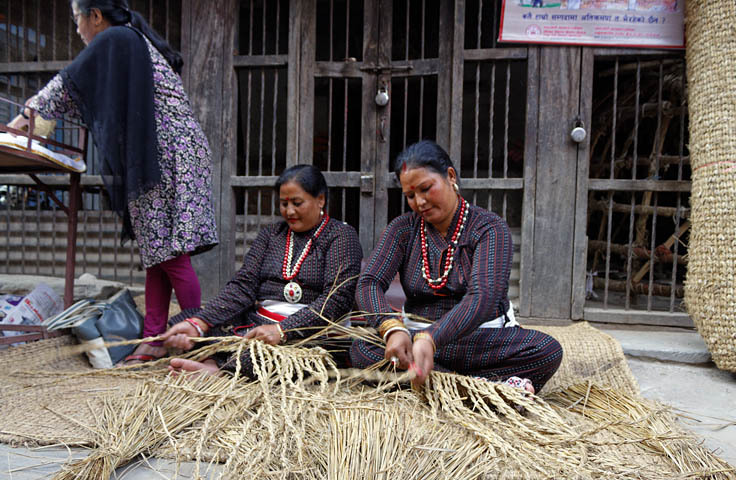 The locals participated enthusiastically in the various activities held during the event. There was a rise in awareness about celebrating carfree days in future for both increased tourism and a more peaceful environment. There was greater awareness of the importance of the street activities and shops in developing local businesses; the opening of new night markets was also considered. There was greater support for the event and the carfree concept from local stakeholders and the community. 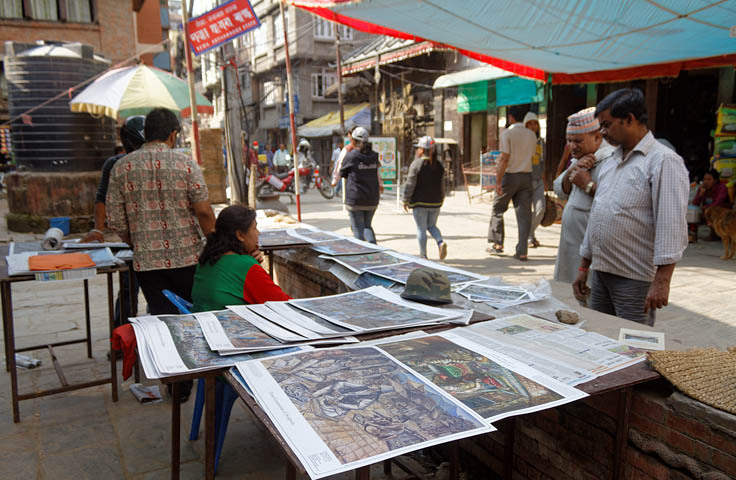 The post-event discussion also called attention to the identification and division of core area streets into distinct sections, with the idea of extending future events to other areas in central Kathmandu. The KtmWalks team discussed the possibility of a promotional community presentation to explore the prospects for extending future events to other cities and towns in the Kathmandu Valley, such as Patan and Kirtipur, and possibly even outside the Valley. The possibility of making core areas carfree during major festivals and cultural events was also discussed. The community's desire for a repeat event sooner than the next World Carfree Day was a highly favorable outcome and indicates that local people are taking ownership of the event and the concept. The event has become locally relevant, which helps to ensure its continuity. In a country like Nepal, World Carfree Day can be a good way to introduce the discussion about motor vehicles in cities and to show how our cities might look, feel, and sound without cars and motorcycles. "China Is Building A Huge Eco-City Where No One Will Need To Drive"
"Carless cities are Europe’s future"
"Africa's cleanest city is officially a car-free zone"
"Boring cityscapes increase sadness, addiction and disease-related stress. Is urban design a matter of public health?" "The Long-Term Impact of a Month Without Cars"
"What a Bike-Crazy California Town Can Teach Us About Car-Free Cities"
"Car-free Europe? Paris, Brussels, Stockholm try it for a day"
"Will the Pope's Visit Lead to Massive Car-Free Days in Philly?" "6 Big European Cities With Plans to Go Car-Free"
"Scenes From the Big Car-Free Day in Paris "
"Why Oslo is banning cars from the city center"
"Swedish capital goes car free for the first time"
"Entire Delhi will go car-free on Jan 22, we will cycle to work, says Kejriwal"
"Living a Car-Free Life "
"Why I'm giving up on car-free living"
"Why we need a politics of the far future"
"Consume more, conserve more: sorry, but we just can't do both"
"New studies deepen concerns about a climate-change 'wild card'"
"The math on staying below 2° of global warming looks increasingly brutal"
"World on track for warming 'far above' 2°C target: analysts"
"World Set to Exhaust 75% of 'Carbon Budget' by 2030, UN Says"
"UN Report Shows World's Pledges for Paris Are Recipe for Climate 'Disaster'"
"Most Comprehensive Paleoclimate Reconstruction Confirms Hockey Stick"
"'Exxons of Agriculture' Wielding Power to Block Real Climate Solutions: Report"
"World set to use more energy for cooling than heating"
"With Renewables on the Rise, Dirty Fuels Losing Competitive Edge"
"Cities Could Save $17 Trillion Just By Reducing Their Greenhouse Gas Emissions"
"The innovative delivery system transforming Gothenburg's roads"
"New Study Shows Just How Deadly Air Pollution Really Is"
"The Best Ways to Get to Work, According to Science"
"Beijing banned cars for 2 weeks and the sky turned perfectly blue. Guess what happened the next day?" "Volkswagen Diesel Scandal 2015: Emissions Likely Killed Up To 94 People In The US, Analysis Shows"
"Scientists Discovered High Levels Of Radioactivity In A Common Form Of Waste"
"By 2018, Dutch rail will be fully powered by wind"
The next issue of Carfree Times is scheduled for March 2016. In this day of corporate-influenced media, Carfree.com declares its ownership and sources of support at the end of each year. Carfree.com is wholly owned by Joel Crawford, the legal name of author J.H. Crawford. Its operation is financed by J.H. Crawford. It generates no revenues directly but does help support book sales. Carfree.com accepts review copies of books but makes no commitment to review them. J.H. Crawford receives no commissions from the sale of books mentioned on Carfree.com. E-mail announcements of new issues of Carfree Times are mailed to approximately 750 subscribers. A rough estimate of first-year circulation for each new issue is 5000. All the issues ever published are still being read. Carfree.com as a whole will have served approximately 1.3 million pages and 95 GB of files in 2015.